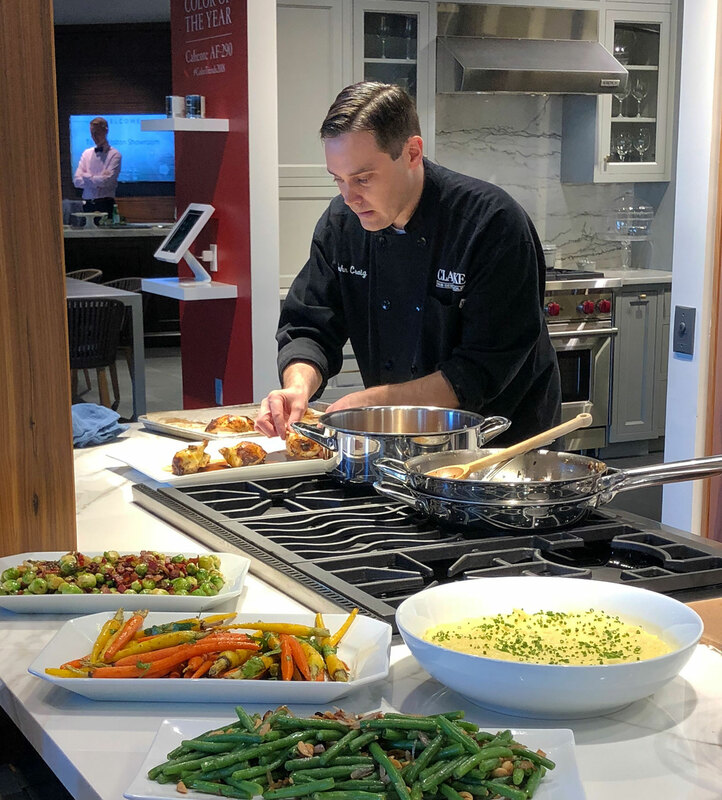 We recently met Executive Corporate Chef John Craig of Clarke at the 7 Tide Showroom in the Seaport, where he whipped up a holiday feast on Wolf’s professional grade (and time-saving!) appliances. 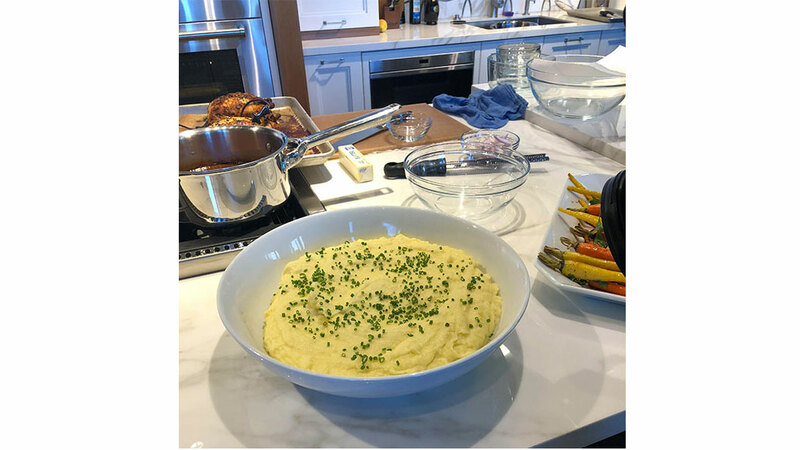 We are certainly thankful for the following recipes and wanted to share…. Directions: Insert probe in the breast, making sure to cover as much meat as possible. Once game hens are roasted, portion them in breast and thigh pieces. 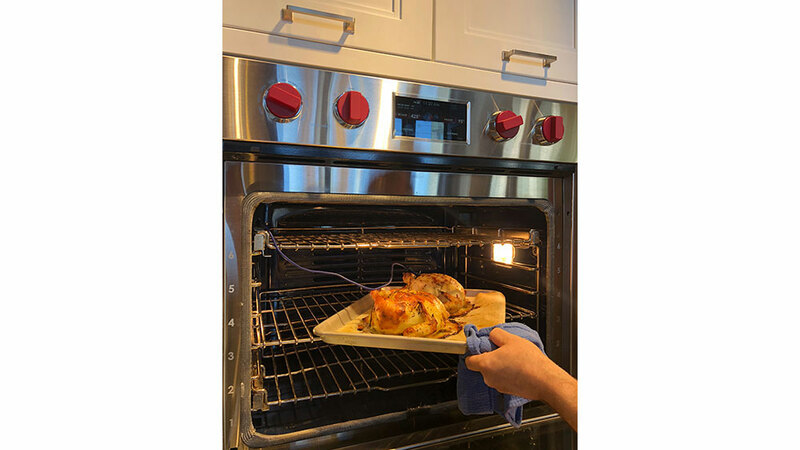 If desired, reinsert the pieces in the oven at convection roast at 450 degrees F° for a couple of minutes to crisp up the skin before serving. Directions: Place the potatoes in a large saucepan. Cover with 1 to 2 inches cold water and season generously with salt. The water should taste like seawater! Bring the pot of water to a boil and cook potatoes until they are fork-tender, about 20 to 25 minutes. Drain the potatoes and pass through a food mill or ricer. Bring the heavy cream to a boil in a small saucepan. Once the cream has come to a boil, remove from the heat. While the potatoes are still hot, add 1/3 of the cream and butter and stir well. Repeat this process 2 more times until all the cream and butter are incorporated. Taste the potatoes for seasoning and add salt, if needed. Serve immediately or cover and keep warm until ready to be served. 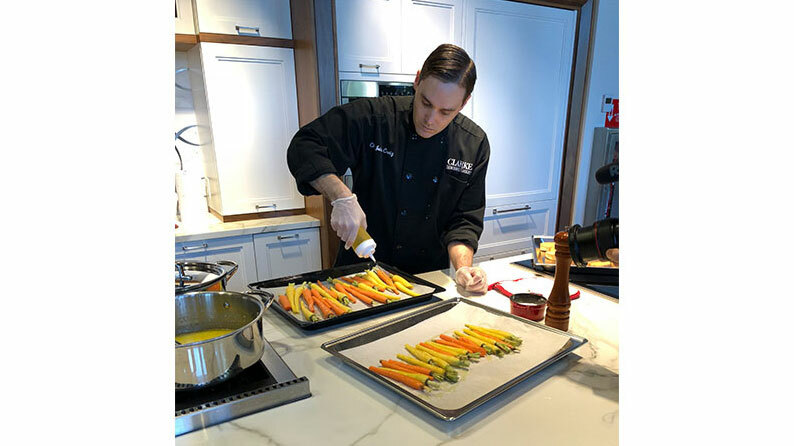 Toss the rainbow carrots with the olive oil and salt and lay on a solid tray, or the steam oven porcelain baking sheet if available. Roast for 7 minutes and toss carrots, roast for an additional 6 minutes or until tender. Remove tray and toss carrots with the chopped parsley and apple cider syrup. Directions: Turn induction burner onto a medium-high setting. Add the bacon strips and cook for about 5-7 minutes, or until crispy. Remove to a paper towel-lined plate then roughly chop. In the same pan with bacon fat, melt the butter over high heat. 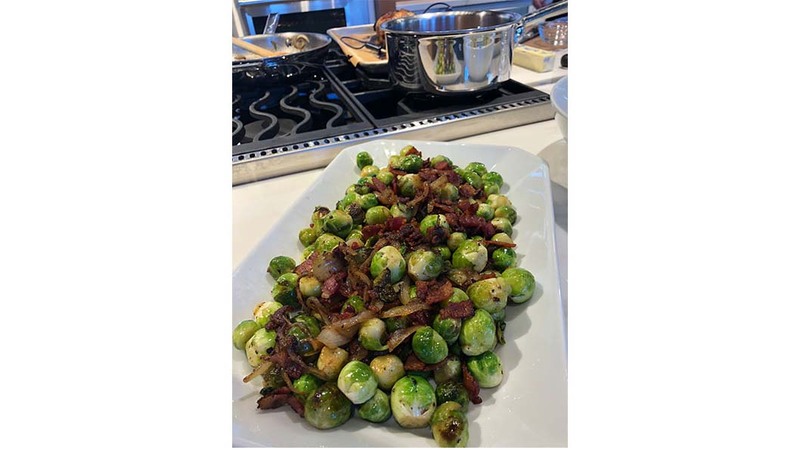 Add the trimmed brussels sprouts and the sliced onion and sauté for about 5 minutes or until well colored and crispy on the outside. Re-enter the bacon and quickly heat through. Season with salt and pepper.